4 years & up. 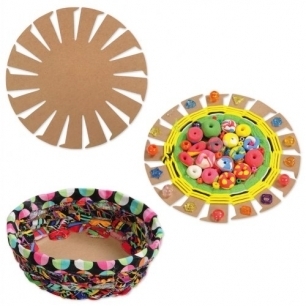 Make extraordinary baskets or collage masterpieces with this set of 24 cardboard basket forms. Young children can use simple collage materials, glue, markers, and crayons to express themselves artistically. Older children will love the magical way the simple round notched shape turns into a basket. The basket form is easy-to-weave with simple up and down movements using weaving materials. Use with yarn, fabric strips, raffia, and all types of natural items. Add beads to the basket while weaving for added interest. Basket form measures 9" in diameter and finished basket measures 2" high and 5" at the base.